If you love garlic, but you've never experienced the fresh, unadulterated taste of homemade garlic powder, then you're in for a pleasant surprise. No factory-processed garlic powder can begin to compare to that which you have made yourself. In The Complete Guide to Making Great Garlic Powder"you'll discover why all those storebought garlic powders are so second-rate (and why some of them may even be downright unhealthy). You'll learn the secrets to growning lush, wholesome garlic bulbs without using any synthetic chemicals. And you'll see just how easy it is to make your own powdered garlic by following the author's basic four-step home process. Please Note: "Making Great Garlic Powder" was originally published as a print-and-paper book in 2003. It was sold by the Garlic Seed Foundation and in three popular garden seed catalogs before going out of print. Several thousand copies were sold for $6.95. But there is so little profit in selling a book for that amount that it was never reprinted. But now, with the option of an inexpensive pdf download, this once-popular book is available again. The pdf version being offered here is a facsimilie of the first printing. It has 38 pages and 14 drawings. The original book measured 6" by 9" but the pages in this pdf version have been enlarged. So if you print the pages out after downloading the file, each will fill a standard sheet of paper. This makes the book easier to read. 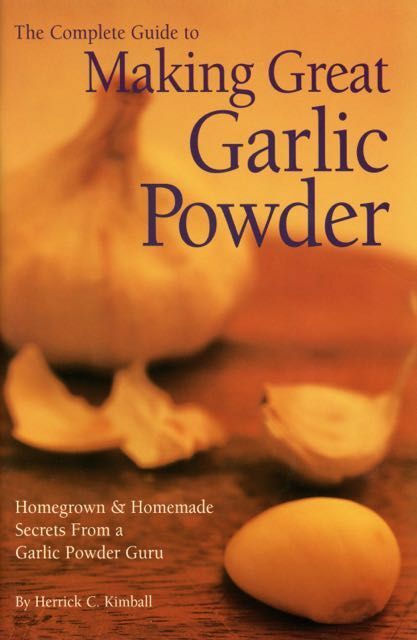 Although the book is now several years old, and some of the information on the two "Resources" pages at the back of the book is out of date, all the why-and-how of making truly great garlic powder is still as pertinent, inspiring and useful as ever.